I wonder how many were able to have similar jobs after the war. 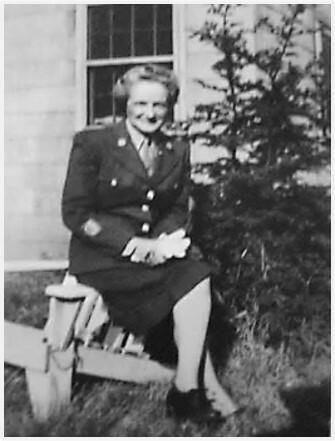 I’ve read stories of some former WACs who strongly believed that serving in the WACs during WWII got them started down very rewarding career paths. However, my sense is that many WACs returned to more traditional roles and jobs once the war ended. You are probably right. My mother is in that age group and she had to leave a job because she was pregnant. I remember job ads separated by “for women or men”. Great research. I worked in the aerospace industry and part of the industry’s history was about how women took over the building of planes during the war. They were almost all sent back to the kitchen or secretarial pools when the war ended. It’s sad that the women were not allowed to keep those types of jobs after the war ended. In some ways it seems like women made huge gains during WWII–and then many of the gains were wiped out when it ended; though perhaps the WACs in WWII provided some of the early momentum for what later became the women’s movement. That’s an interesting list, filled with terms that I’ve never seen before. “Draftsman” and “cook” are self-explanatory, but what in the world is a “theodolite observer”? I learned something new. Thanks for researching this. You also make a good point about how women in many countries served in a variety of roles as they helped support the war effort. It is a long list. 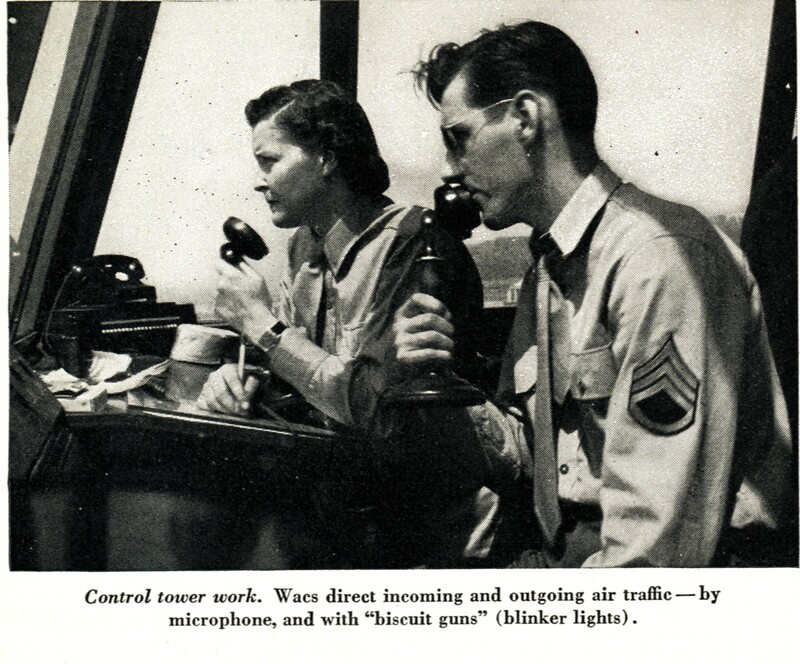 The women in the WACs had a wide range of career opportunities. Isn’t it interesting how many of the WAC jobs make reference to men, though?! One job on the list is for “public relations man,” another “gas and oil man.” It’s as if they simply had no language for what this war was asking of people! 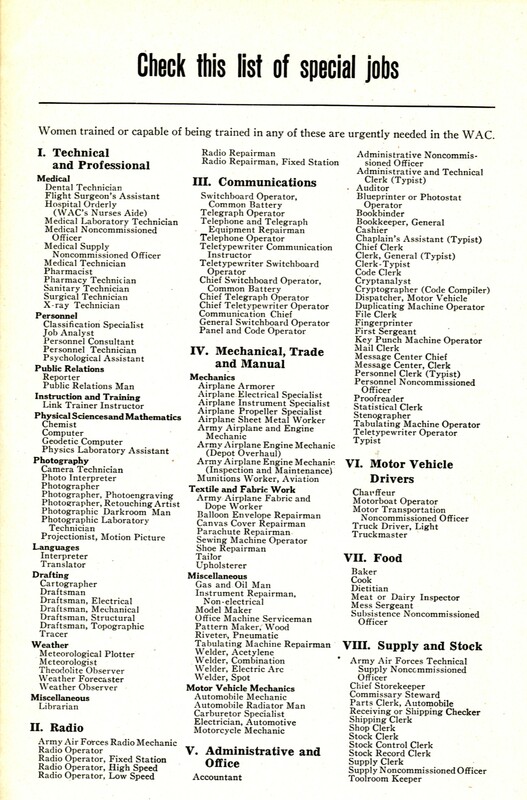 It seems really odd that in an era when many job titles were gendered (for example, stewardesses) that the military referred to some of the jobs in the list using male titles. You’re probably right that they just didn’t have appropriate terminology for some of the positions. 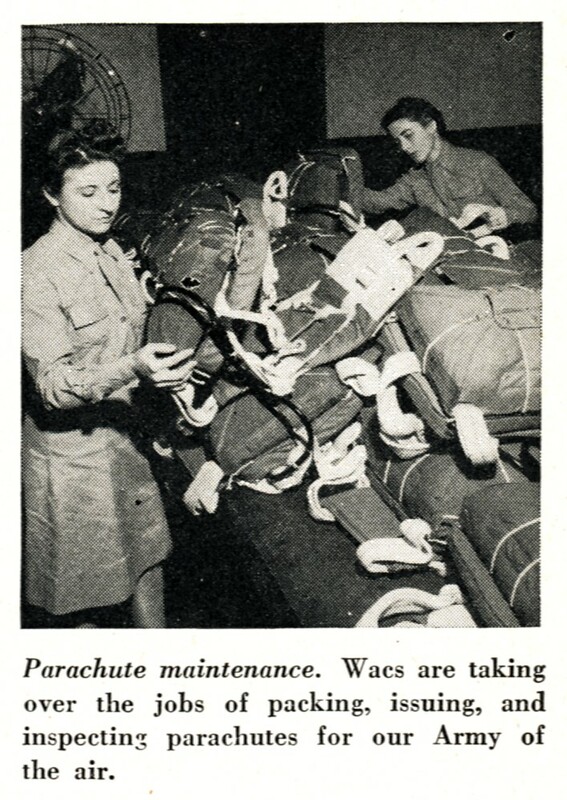 It would be really interesting to know if there was any discussion back then about whether or not the titles were appropriate for WACs serving in those roles. That is an amazing list of important jobs. I wonder how many got to choose their job or if they were assigned a job. I am sure the women were hard workers and proud to do the work. My understanding is that the women were assigned to jobs–and that they worried about whether they would get the positions they wanted. That said, I think that they might have been able to provide some input regarding their interests and preferences. I too wonder how the women were assigned their jobs? Wonder if they had a choice based on interest or skill? My understanding is that assignments were based primarily upon need, knowledge, and skills. I am sure that was a list that would have been very appealing to many young (and not so young) women.